Medea with cauldron, Roman copy of c. 420 BCE original. MEDEA, in Greek legend, a famous sorceress, daughter of Aeetes, king of Colchis. Having been thrown into prison by her father, who was afraid of being injured by her witchcraft, she escaped by means of her art and fled to the temple of Helios the Sun-god, her reputed grandfather. She fell in love with Jason the Argonaut, who reached Colchis at this time, and exacted a terrible revenge for his faithlessness. After the murder of Jason's second wife and her own children, she fled from Corinth in her car drawn by dragons, the gift of Helios, to Athens, where she married king Aegeus, by whom she had a son, Medus. But the discovery of an attempt on the life of Theseus, the son of Aegeus, forced her to leave Athens (Apollodorus i. 9, 28; Pausanias ii. 3, 6-11; Diod. Sic. iv. 45, 46, 54-56). Accompanied by her son, she returned to Colchis, and restored her father to the throne, of which he had been deprived by his own brother Perses. Medus was regarded as the eponymous hero and progenitor of the Medes. 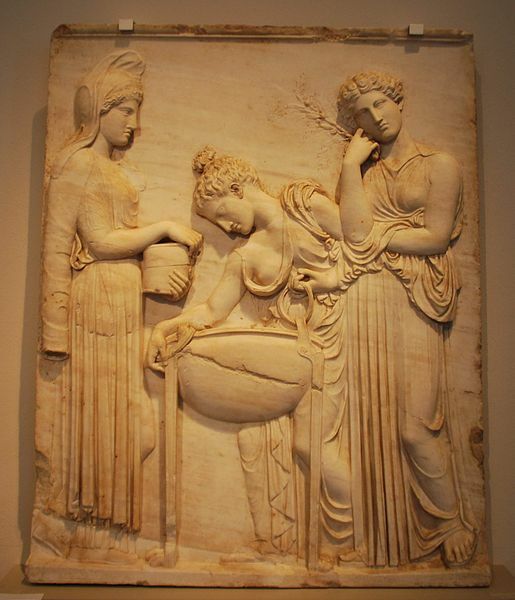 Medea was honoured as a goddess at Corinth, and was said to have become the wife of Achilles in the Elysian fields. The chief seat of her cult, however, was Thessaly, which was always regarded as the home of magic. As time went on her character was less favourably described. In the case of Jason and the Argonauts, she plays the part of a kindly, good-natured fairy; Euripides, however, makes her a barbarous priestess of Hecate, while the Alexandrian writers depicted her in still darker colours. Some authorities regard Medea as a lunar divinity, but the ancient conception of her as a Thessalian sorceress is probably correct. The popularity of the story of Jason and Medea in antiquity is shown by the large amount of literature on the subject. The original story was probably contained in an old epic poem, the authorship of which was ascribed to Prodicus of Phocaea. It is given at some length in the fourth Pythian ode of Pindar, and forms the subject of the Argonautica of Apollonius Rhodius. There is a touching epistle (Medea to Jason) in the Heroides of Ovid. Medea is the heroine of extant tragedies of Euripides and Seneca; those of Aeschylus and Ennius (adapted from Euripides) are lost. Neophron of Sicyon and Melanthius wrote plays of the same name. Among modern writers on the same theme may be mentioned T. Corneille, F. Grillparzer and M. Cherubini (opera). The death of Glauce and the murder of her children by Medea was frequently represented in ancient art. In the famous picture of Tomomachus of Byzantium Medea is deliberating whether or not she shall kill her children; there are copies of this painting in the mural decorations of Herculaneum and Pompeii. Photo credit: (Above) Marcus Cyron / Wikimedia Commons; (below) Wikimedia Commons. 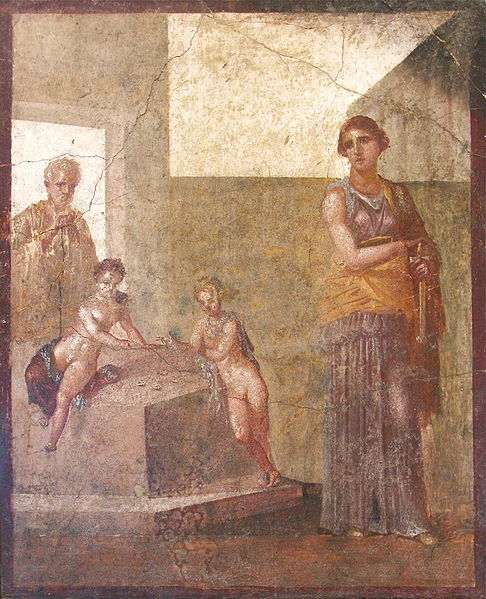 Medea debates murdering her children, Roman mural, Casa de Discorii, Pompeii, c. 1st c. CE.